Smorgasbord originally meant a Swedish buffet, but now the term refers to a wide range of options, a variety of styles. That variety is one of the things I love about the current offerings in multi-author boxed sets. The sets are a way to discover and “try out” new-to-me authors at a price that seem too good to be true. How can you beat $.99-$2.99 for groups of novels from your favorite authors? I’ve discovered really good books by picking up a friend’s box set—and discovering new favorites. 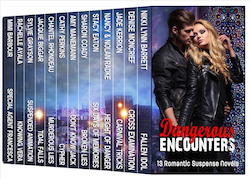 DANGEROUS ENCOUNTERS just released and is heating up more than the bestseller list! With a variety of heat levels, there’s a story to tempt everyone. Tamara Slay moves to Louisiana to start a new life with her daughter, but her dreams of a peaceful existence are shattered when Lt. Martin Beck suspects her ex-husband is a serial killer. A dying scientist propels a waitress into the shady world of corporate espionage. The unwilling carrier of the recipe for a lethal chemical weapon, can Sofia save the world when she can't even save herself? How do you keep a woman safe who distrusts you, and won't stay where you hide her? CIA operative Owen Putman has to protect his employer's daughter while trying to find out who is killing construction workers at a Central American dam site. Detective Natasha Foster comes across the crime scene of her career, and she will put everything on the line to find out the truth, including her heart. Jay's need to know if he's the victim or criminal pushes him to remember who he is and with the pull of a trigger, Jay's memory will suddenly return and with it, the terrible truth. Bodyguard Niall Kerrigan lets his guard down and falls for Abby Bailey, a beautiful woman with a secret past. When Abby goes missing Niall must face his ruthless father to fight for the woman he loves and choose between a life with her or keeping her safe without him. Undercover FBI agent Jack Hamlin meets his match in small town bakery owner, Kate Monroe, when they're swept into a dangerous game of lies, intrigue and desire. When a hit man kills the wrong person, a SC detective confronts hidden agendas and conflicting motives in a powerful local family, while trying to control his attraction to the intended victim--a woman who's hell-bent on saving the remnants of her family. Max is exonerated for murder after eight years, returning to his home town and the fiancée he left there. Rose isn't so happy to see him...and then the murders start again. When Nick fails to notice an IED and loses most of his teammates, he shuts down. It takes meeting and falling in love with a woman in danger to make him realize life's worth living. Suspense, spicy romance and attempted murder erupt when hockey player Brett hires Katy to run the office of his ailing father's near-bankrupt trucking company. Can he protect her from her lethal friends and the chaos surrounding them? Suspenseful romance, an unsolved murder, and love on the beach. A young woman seeks to prove her father innocent of murdering her boyfriend's mother. Violence, suspense and sizzling romance explode during Special Agent Francesca's humorous journey fighting off the mob! Dr. Sean Collins wants to tame her! Yeah-like that's gonna happen. Only one thing keeps Francesca motivated. Proving to her mother, the FBI "Snow Queen," that working undercover is where she belongs. I hope you’ll take a moment to check out this amazing deal and if you give the stories a try, I hope you come back and share your experience with us. Thanks for letting us share the news about our box set. We're really excited about the collection. So excited to be working with these wonderful authors in this set. Thank you for sharing our new release! I love boxed sets because of the variety. Thanks for introducing me to a new one. Thank you so much for hosting us!